They started out with the title of undertaker. Over the years this title slowly evolved to mortician. Now they are known as funeral directors. They perform a vital service to grieving families who, in many cases, are having an extremely difficult time coping with the loss of a loved one. In many areas of America they have served several generations of the same family. Funeral home records are usually well kept and accurate—and a great source of genealogical information. In some cases they have copies of death certificates and obituaries in their files. They can usually put you in touch with the next of kin of the deceased person you are searching for. In fact, oftentimes, if you write them a short note explaining why you are trying to contact the family, they’ll simply pass the note on to the family, who in turn can contact you. TIP: If you don’t have any cemetery information, make sure to ask the funeral home about the cemetery where the person was buried and whether or not they can provide an address or phone number for the cemetery office. • Names of others involved – officiating clergyman, memorial company, etc. 1) Find a death certificate, which often lists the funeral home. 2) Find a cemetery records, which sometimes lists the funeral home. 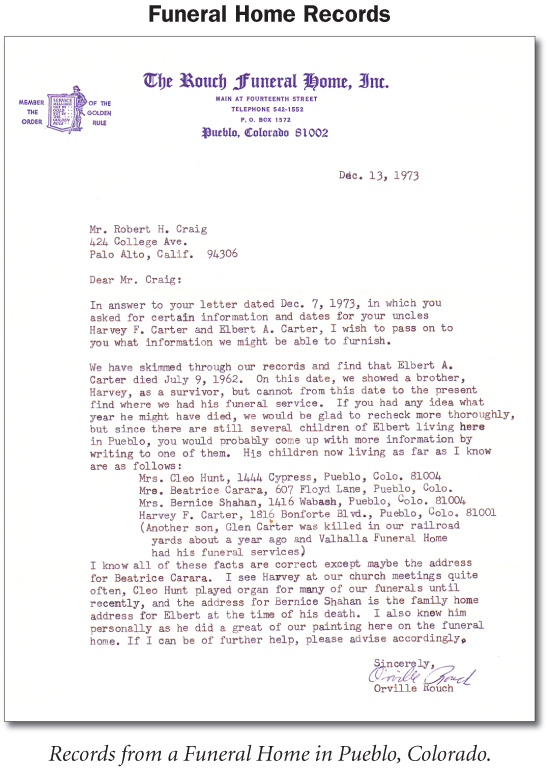 3) Get the names of all the funeral homes in the town or county and write them a letter. To get an address for the funeral home, use the Internet or call or visit any funeral director in your area and ask if you can use their directory of funeral homes, The Yellow Book. In your letter give them the any information you have, including names, dates, places. Ask them to check their records for any additional information — and especially the names and addresses of any relatives they might have.